The amount of biological diversity at all levels of biological organization—from genes to ecosystems—fascinates me. This interest is the reason I study evolutionary biology, which attempts to understand the origins and patterns of such diversity. A major theme of my research is merging concepts from ecology, physiology, mathematics, computer science, and molecular biology in an attempt to elucidate how diversity arises and, hopefully, identify generalities in the diversification process found within and among species. Individuals of a species mate with one another non-randomly: individuals closer in space tend to mate more frequently than individuals who live further apart. This phenomenon, known as genetic “isolation-by-distance,” is nearly ubiquitous in natural populations and relies on a balance of two factors: population size and migration. Though isolation by distance is a common pattern in nature, its effect size can vary widely from one species to another. One possible explanation for this variation is physiological constraints of a particular taxon. Another (non-mutually exclusive) explanation is that the environment or landscape modulates migration and population size. In one research project, I asked if populations of a widespread and abundant southeastern USA frog, the squirrel tree frog (Hyla squirella), exhibited a pattern of isolation-by-distance and, if so, could environment or landscape data contribute in explaining variation in genetic divergence. Amphibians are well studied in population genetics because their life-history and physiological need for aquatic habitat during breeding shapes the pattern of genetic structure observed across the landscape. The squirrel tree frog is interesting to me because in addition to breeding in natural aquatic habitats they breed in anthropogenic structures (such as road-side ditches). Since much of the landscape across the southeast has been recently modified from natural habitat to pastures, tree plantations, and urban habitat, I was curious if any of the aforementioned habitats could potentially contribute to among-population genetic divergence. Comparing variation present at putatively neutral evolving molecular markers (microsatellites), I found that much of this variation could be explained by proximity to nearby populations (in other words, these populations have isolation-by-distance). In addition, I found that considering not only spatial distance between populations but also the percentage of upland oak habitat and the percentage of urbanized habitat that exist between two populations nearly doubles the amount of variation explained in genetic divergence estimates. It’s quite possible that these associations in landscape data and genetic data are simply correlations; however, these associations could spark future manipulative experiments that can directly assess cause and effect. It is noteworthy to make an analogy between ecological speciation and landscape genetics (mentioned above) that may characterize my research interests. That is, landscape genetics is to isolation-by-distance as ecological speciation is to the more familiar allopatric speciation. In both cases there exists a spatial component to genetic divergence that has been studied extensively. In addition, there exists an ecological component to genetic divergence that, until recently, has received less attention. This is not to say that “the ecology” of a system was deemed irrelevant until recently. Rather, only until recently has it been computationally easier to collect and analyze ecological data at the scale that population genetics studies take place. Niko Balkenhol, professor at the University of Goettingen, once wrote, “Ecosystems are the stage on which the play of evolution unfolds.” It’s certainly true that ecosystems set the stage where evolutionary processes interact. It’s also worthwhile, I argue, to identify the mechanisms that start a completely interbreeding set of individuals to evolve into independent lineages and ask whether general mechanisms exist. Therefore, the core of my dissertation work at the University of Idaho takes a comparative approach to identify patterns of genomic divergence during ecological speciation. One example of ecological speciation-in-action occurs in the Chihuahuan desert of the southwestern USA. 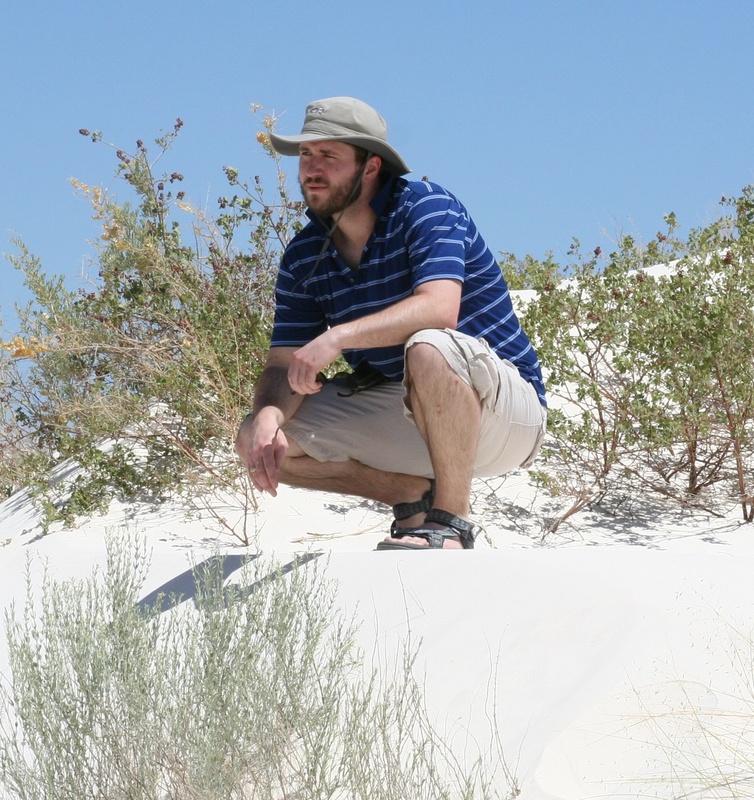 Over the last decade, my co-advisor Erica Bree Rosenblum has studied the local adaptation of lizards at White Sands National Monument, New Mexico, which consist of brilliantly white gypsum sand deposits responsible for forming a stark ecological boundary with the surrounding Adobe soils that typify the southwest. Absolutely fascinating to me is that three lizard species occupy these gypsum sand dunes and appear light in color while their conspecifics in the surrounding desert are dark. Further, we know that variation at a single gene, melanocortin 1 receptor (mc1r), has a large effect on color. It is unknown, however, how variation at mc1r shapes divergence at other regions of the genome. Currently, I’m using next-generation technology to sequence the region of the genome that surrounds mc1r and comparing differences observed between dark and light individuals in this region and with other regions of the genome. Theory predicts that if natural selection is important in keeping White Sands individuals light and dark soils individuals dark then genes in close proximity to mc1r will effectively be linked together. I’m curious to see the influence of such selection on the rest of the genome. In other words, how much of the region flanking mc1r is diverged between White Sands and dark soils? Also, we know that other traits differ between White Sands and dark soils populations. Is natural selection acting on each trait independently or does it effectively act in a single “color” dimension with other traits merely in linkage to mc1r?